Savvy tech, even if you're not tech savvy. BrightCard enables businesses to maximize the advantages to be gained from the integration of smart card, RFID, and NFC technology into their value chains. A smart card is a plastic card about the size of a credit card, with an embedded microchip that can be loaded with data, used for telephone calling, electronic cash payments, and other applications, and then periodically refreshed for additional use. RFID may be embedded into a number of items in order to control access, track products, and streamline various processes. We can help you figure out which implementation is right for your processes. NFC allows portable devices to establish peer-to-peer communications. Data may be passed from one device to another by contact or close proximity. Most cell phones now support NFC, making it a cost-effective solution. We advise clients on the graphic design of cards, and have software tools designed specifically to ease the process of setting up the layout. We can arrange for batch production, and can ensure the lowest cost to our clients. We provide consultation on how you can streamline operations through smart card and contactless technologies. RFID tags can lower cost and increase efficiency. Standards-compliant contactless chips can be embedded in a wide range of different carriers to meet many different utilization scenarios. These include keyfobs, disctags, labels, and wristbands. Available in many different sizes with either 125 kHz or 13.56 MHz modules, each provides a solution to a different operating environment. BrightCard Inc., based in Rockville, MD, near the Nation’s capital, is specialized in the provision of smart card technologies to vertical industry solutions providers. 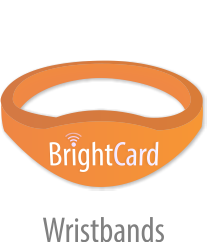 Through a wide range of relations with major global vendors as well as leading-edge technology specialists, BrightCard maintains up-to-date information on available technologies, including cards, readers, and platforms, so as to be able to advise clients on their best choices for a given set of requirements. This expertise is of particular importance in North America, where there are fewer deployments of traditional contact smart cards, creating demand for our assistance in understanding the capabilities of the latest smart card capabilities. BrightCard draws on its extensive relations in Europe, home to many of the key technologies, to help its clients keep up with the latest developments worldwide. BrightCard provides consulting services to help systems integrators and solutions providers adapt their systems architecture to maximize the advantages to be gained from the integration of smart card technology into their value chain. This often includes helping clients appreciate the enormous advantages in security and information accessibility that smart cards offer over traditional barcode or magstripe solutions. BrightCard helps its clients understand the wide range of existing smart card and RFID technologies, and their costs, so they can make the most well-informed choices to meet service delivery requirements. We offer an extensive range of leading-edge technologies, using both contact and contactless cards, and can source unique technologies and card requirements to meet nearly any specific requirement. 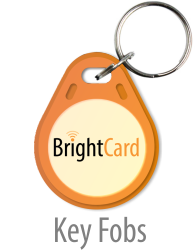 BrightCard has, in particular, developed unique expertise in the deployment of smart card systems in remote, mobile and temporary environments. Smart cards can be securely encoded with extensive customized information, and are used to control access to a wide range of services and facilities. 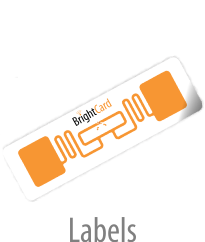 Our extensive hands-on experience has given BrightCard unique experience is deploying mobile smart card systems, including card production/printing/encoding, web-based services, readers and workstations, and smart phone data verification services. 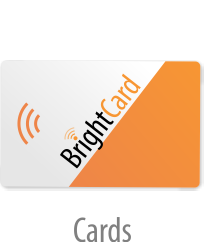 BrightCard offers a wide range of services in mobile deployments of smart card related systems. We are particularly well-versed in the new technologies of RFID, contactless smart cards, NFC, and wireless service integration. We have unique expertise in the development and customization of software on cellphones, laptops, and tablets destined to be operated in mobile and remote locations. We offer a wide range of specialized smart card equipment (including readers, printers, modules, smartphones, and rugged PDAs) for nearly any deployment scenario you may envision. Our staff provides on-site set-up and training services to ensure that client personnel are fully able to operate the systems on their own. 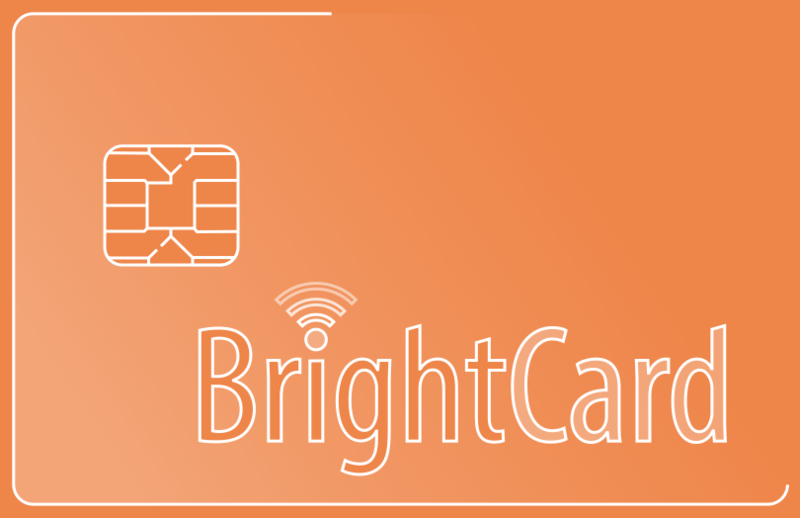 BrightCard is dedicated to responding to your needs in order to find the most appropriate smart card technologies to solve your problems. Contact us to find out how we can help you. RFID labels have an adhesive top which protects a chip and antenna, while allowing them to be permanently fixed to limitless items. Labels are available with different IC technologies (13.56 MHz) and can be produced in different sizes. The delivery form is single die cuts or on reel. RFID wristbands come in a wide range of personalization options. Regardless of wristband design, they are available with all standard chips as LF 125KHz (EM, Hitag) and HF 13.65 MHz (Mifare, DESFire). Contactless RFID Cards are extremely durable. Because they need not contact card readers, they see little wear. Furthermore, they are extremely resistant to dirt and moisture. Inside contactless cards are a microchip and an antenna. The microchip controls all communication with the reader, as well as data storage, data encryption and security of access. There are different types of microchips which may be used, to support multiple applications. We offer card design and personalization options, as well as software to manage card templates. Key fobs are available with the most common RFID chip types in 125 kHz, 13.56 MHz and in UHF on request.